AMSTERDAM, April 15, 2019 /PRNewswire/ -- At the European Congress of Clinical Microbiology and Infectious Diseases (www.eccmid.org), Bruker announces new assays, software and library extensions for its MALDI Biotyper, IR Biotyper and Fluorocycler XT product lines for microbial identification, infection control and molecular diagnostics of infectious diseases. For the MALDI Biotyper (MBT) platform, 238 new bacteria and yeast species have been added in the new CE-IVD marked in-vitro diagnostics (IVD) and research-use-only (RUO) reference libraries. This brings the number of different bacterial and fungal species that can be reliably and quickly identified with the CE-IVD marked MALDI Biotyper to 2,887. This achievement makes the MBT an almost universal and always evolving platform for fast microbial identification from isolates by molecular protein fingerprinting, with outstanding data quality and robustness, lower cost per ID, and dramatically broader identification scope than all other molecular platforms. A focus for the new MBT library expansions introduced at ECCMID 2019 is the rapid inclusion of emerging pathogens like Elizabethkingia anophelis, in order to keep MBT users up to date with the latest healthcare threats. Moreover, the MBT Mycobacteria Library (IVD & RUO) has been expanded by 14 species, and now covers 178 mycobacteria species. The MBT Filamentous Fungi Library (RUO) has been expanded by 27 new species, and now covers 180 fungal species. With the modular MBT bioinformatics architecture any new isolates of interest can be added for further learning and expansion of this 'gold standard' fast microbial ID system. In the MBT RUO library version, new isolates can even be added by trained microbiology customers themselves. For higher throughput, the new MBT HT™ software (RUO) has been launched to support, e.g., larger microbiome research projects with a culturomics approach. The new MBT HT software significantly reduces the data analysis time per isolate using an optimized multi-threading approach. The improved Sepsityper kit (CE-IVD) for rapid and cost-effective microbial ID from positive blood cultures (PBC) is now available with a new formulation that increases MBT ID rates even further. It also improves the PBC ID workflow and reduces hands-on time. Miriam Cordovana, Microbiologist in the Department of Bacteriology and Mycobacteriology of the S. Orsola-Malpighi University Hospital in Bologna, Italy, stated: "We have been successfully using the Sepsityper kit for fast ID from positive blood cultures in our laboratory since more than a year. The recently introduced rapid workflow has shortened the time-to-result and includes fewer manual steps. With the new Sepsityper formulation, we were able to further increase the identification rate from PBCs to more than 90% of all tested isolates in a recent internal study." For infection control and hospital hygiene, further improvements in visualization, statistics and bioinformatics have been implemented in the IR Biotyper 2.1 (RUO), which assists infection control specialists to analyze potential outbreak scenarios on site within minutes after cultivation. The major benefits are the fast turn-around-times (TAT) that are required to provide actionable results for timely infection control decisions. In other cases, an outbreak can be ruled out, and time-consuming, costly molecular analysis or outsourced NGS with much longer TATs can be avoided. Dr. Wolfgang Pusch, Executive Vice President Microbiology & Diagnostics at Bruker Daltonics, commented: "We are very pleased with the continuous improvements of our market-leading MALDI Biotyper platform in microbial species coverage and throughput. We also continue to expand the MBT menu of assays with significant clinical benefit, such as the MBT Sepsityper kit for fast ID from PBCs, and selected, high-value MBT antibiotics resistance assays. The 'gold standard' MBT fast ID platform is complemented in infection control by our enhanced IR Biotyper for better, faster and more cost-effective strain-typing compared to conventional hygiene testing methods." 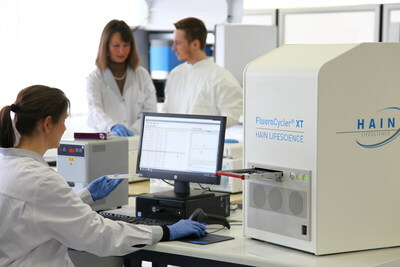 In March 2019, Bruker launched the high-performance FluoroCycler XT platform (CE-IVD), a novel, next-generation PCR thermal cycler and reader that enables the unique new Liquid Array™ family of high-sensitivity, fast turn-around and cost-effective mid-plex assays, directly from sample without culturing steps. A novel tuberculosis assay FluoroType MTBDR 2.0 (CE-IVD) detects more than 60 mutations in MTB genes for up to 522 resistance patterns to guide therapy. 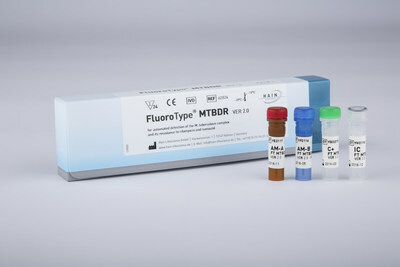 At ECCMID 2019, an assay for transplant medicine has been added to the FluoroCycler XT, i.e. the Fluorotype HSV assay for herpes simplex viral analysis, which complements the Fluorotype BKV HT assay for the BK polyoma-virus on the established FluoroCycler platform. Moreover, all Bruker molecular assays for invasive fungal diseases, including Fungiplex Aspergillus, Fungiplex Aspergillus Azole-R, Fungiplex Candida (all CE-IVD), Fungiplex Candida auris (RUO) and Fungiplex Universal (RUO screening), plus the Carbaplex assay (CE-IVD) for carbapeneme resistance detection, have been added on the new FluoroCycler XT platform. David Hain and Wolfgang Pusch, Managing Directors of Bruker-Hain Diagnostics, concluded: "Bruker is very excited about the novel, high-performance Fluorocycler XT PCR platform, and our ECCMID release of a growing menu of fast, ultra-sensitive, and clinically differentiated Liquid Array and real-time PCR assays for tuberculosis, invasive fungal diseases and selected viral infections." The MALDI Biotyper enables molecular identification of bacteria, yeasts and fungi. Classification and identification of microorganisms is achieved reliably and quickly using proteomic fingerprinting by high-throughput MALDI-TOF mass spectrometry. The MALDI Biotyper uses a molecular approach based on specific proteomic fingerprints from bacterial strains. Many published studies have highlighted the greater accuracy and lower cost, as well as the typically much faster time-to-result (TTR). Applications of various MALDI Biotyper solutions include clinical routine microbial identification, environmental and pharmaceutical analysis, taxonomical research, food and consumer product safety and quality control, as well as marine microbiology. In many European and international laboratories the MALDI Biotyper has replaced classical biochemical testing for bacterial identification in the past few years due to the accuracy, speed, extensive species coverage, ease of use and cost effectiveness of the system. Traditional biochemical techniques detect different metabolic properties of microorganisms, can take many hours or even days for completion, and they often lack specificity. The robust MALDI Biotyper requires minimal sample preparation and offers low consumables cost. The products of the MALDI Biotyper family are available in a research-use-only (RUO) version, as the U.S. FDA-cleared MALDI Biotyper CA System, or in an IVD-CE version according to EU directive EC/98/79. The MALDI Biotyper also has medical device registrations in numerous other countries. RUO versions of the MALDI Biotyper software allow selected, high-value antimicrobial resistance tests. The CE-IVD MBT STAR®-Cepha kit now allows rapid, functional antibiotic resistance testing against Cephalosporins, and the CE-IVD MBT STAR-Carba kit is for fast Carbapenem-resistance testing. Bruker-Hain Diagnostics was formed after the recent acquisition of a majority share of the Hain Lifescience GmbH as a Business Unit for Molecular Diagnostics (MDx) products in Bruker´s Microbiology & Diagnostics business. Hain Lifescience GmbH is the legal manufacturer of the Fluorocycler XT and the MTBDR 2.0 assay. For more information, please visit, www.hain-lifescience.de. Bruker is enabling scientists to make breakthrough discoveries and develop new applications that improve the quality of human life. Bruker's high-performance scientific instruments and high-value analytical and diagnostic solutions enable scientists to explore life and materials at molecular, cellular and microscopic levels. In close cooperation with our customers, Bruker is enabling innovation, improved productivity and customer success in life science molecular research, in applied and pharma applications, in microscopy and nanoanalysis, and in industrial applications, as well as in cell biology, preclinical imaging, clinical phenomics and proteomics research and clinical microbiology. For more information, please visit: www.bruker.com.